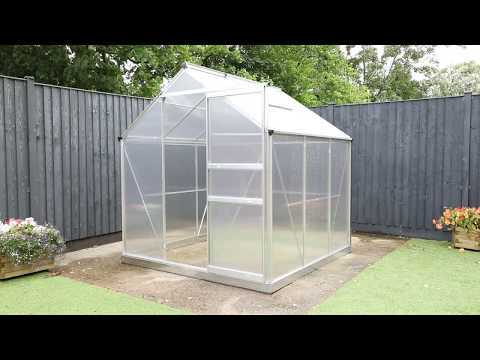 This polycarbonate greenhouse is a great garden building perfect for growing a wide range of vegetables. This spacious greenhouse has a strong aluminium frame which has been coated in green or silver paint for a stylish finish. The aluminium frame has been treated so it is extra strong and resistant to corrosion. This greenhouse has a sliding door which provides a great access and also saves space in your garden. This greenhouse comes with a large roof vent so you can let cool air into this greenhouse during hot summer days. This greenhouse is glazed with polycarbonate glazing which is a great alternative to glass. Polycarbonate is a plastic compound used in greenhouses because it is safe, strong and beneficial to plants. Polycarbonate is much safer than glass because it is 100% shatterproof. This makes it much safer for gardens used by children and pets. Polycarbonate also protects plants from harmful UV rays and burning in hot summer rays. This greenhouse is perfect for any garden providing a useful space to grow a variety of plants. Each greenhouse has twin-wall, eco-friendly 4mm thick polycarbonate glazing for an insulated environment. The free running, sliding door means space inside the constructions can be maximized and integral gutters help collect rainwater that can be used at your convenience. There is also a heavy duty galvanised zinc steel base to provide extra strength. All packs include fixtures, fittings and assembly instructions. Please note that due to the weight of this product, delivery will take between 5 and 7 days, due to courier limitations we are unable to deliver this product outside mainland UK, to Scottish Highlands, Isles or BFPO addresses.